walksheds are the area around a particular point of interest from where people are willing to walk to said point of interest. This point of interest is often a transit station, and the walkshed gives an idea how many people will reach the station on foot. 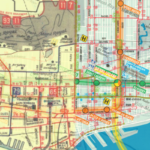 While the walkshed depends on how walkable the area is, whether there are barriers like freeways, the geometry of the street grid, and how attractive the transit station is (people are willing to walk further to metros compared to bus stops), The area is often simplified as a circle around the transit station. How much population lives within the walkshed gives an indication on the ridership of the transit line, the more people live in it – the more ridership can be expected. The corollary is that you want as much population within walksheds as possible. If there are more people near the transit station, it reduces the reliance on feeder buses and park’n’rides (a reduction in park’n’rides also means more land within the walksheds is available for development). This will reduce both the cost of transportation services that have to be offered, and will increases the chances that people use transit – which will reduce the cost of required infrastructure like roads and parking spots, but will also decrease the burden on the environment. The above visualization shows the population within 800m (1/2mile) of Montreal transit stations. This is considered a reasonable distance that people are willing to walk to a rail station. Picking this distance for all stations makes the comparison between stations easier, even if the actual walksheds may be different depending on how walkable the areas are. Also, a circle with 800m radius has about 2 square km of area, so by dividing the number by two, we get the population density (in people per square km). In the image, we can see that many metro stations have more than 20 thousand people living near them, corresponding to more than 10 thousend people per square km. Compare that to the a density of 3.7K people/km² for the whole island of Montreal, 7.7 people/km² for the borough of Côte-des-Neiges–Notre-Dame-de-Grâcee, and 12.3K people/km² for the Plateau. The highest population is near station Cote-Ste-Catherine, the 2nd most populous is Mont-Royal, then Guy-Concordia (which also includes the most densest spot in Montreal). We see that the commuter rail stations generally don’t have many people living near them, especially off the island. Some stations are directly next to highways, others are surrounded by a sea of parking, others are in the middle of nowhere. There is quite a deficit in Transit Oriented Development near many of the commuter rail stations, a missed opportunity. In many places, development would be a better use of station-adjacent land, compared to parking lots, or very low density development. The most populous commuter rail stations outside of the inner city are on the Deux-Montagnes line, at least up to Roxboro – the Deux Montagnes line is the the only electrified line, has the most trains, and by far the most ridership. Some of the stations rival metro stations in terms of population density. Other populous stations are on the Blainville line, at least up to de la Concorde – it would seem that this stretch could also be a candidate for electrification, possibly more infill stations and much more frequent service (incidentally that would also help relieve congestion on the orange line). What is interesting is that some metro stations have surprisingly little population near them. The missed development opportunities may not just exist near the commuter rail stations, but near the metro network itself. While some of those metro stations are also directly next to highways (like de la Savane) and have limited development opportunities, others are in very suburban looking areas that could probably be densified (like Assomption). The data was created using the Canadian census data (from 2011), the gtfs for the STM and AMT was used to find the station locations. And a disclaimer: the stations are considered completely independently; so population of very close stations may be “counted” more than once. 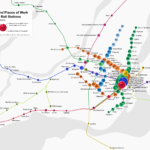 Filed under data visualized, map, Montréal, trains. Nice infographic! 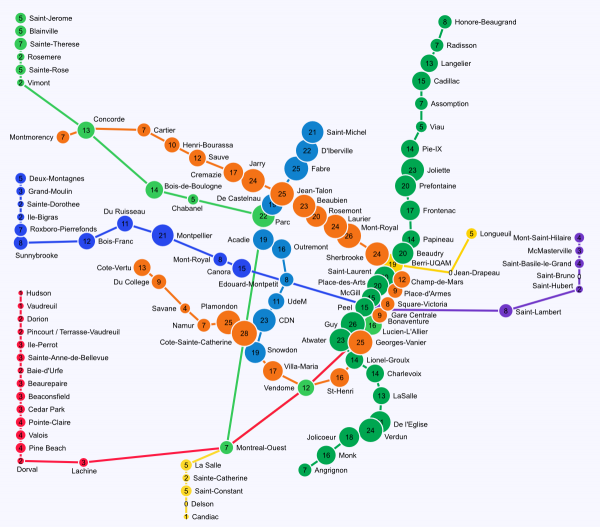 Maybe adding in the expected `Train de l’Est’ or the various proposed metro expansions would give an idea how useful those are. What astonishes me is that some of the metro stations had parking lots on top. For example, Jean-Talon, a major interchange station, has a parking lot above it. IIRC the tunnel part of the Deux-Montagnes (not Montages, btw) line was originally supposed to be replaced by a métro. It’s too bad it wasn’t; routing from Jean-Talon to Édouard-Montpetit and then under the mountain to Peel or McGill would relieve the load on the congested parts of the Orange Line, and would be unusually fast (since you’d have no stops under the mountain). 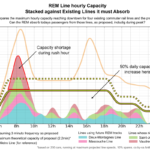 It would have to share tracks with the Blue Line, but the Blue Line passenger loads aren’t that high; doubling the number of trains there would be no problem. It might be nice if you weren’t double-counting nearby stations, at least on the same line. (If only for readability—St-Laurent is so close to Place-des-Arts that its number is hidden by the other circle.) Maybe you could try to allocate population to the nearest station. I used to live near both Peel and McGill, but Peel was slightly closer so I always went there. Well, the tunnel was actually built around 1910, long before the metro. But in the fifties when the plans for the metro were drawn up, the tunnel was supposed to be converted to a metro line, line 3. They ended up building line 4 to Longueuil instead – which is why there’s line 3 missing in the metro system. There are plans to create a tunnel station at Edouard Montpetit which would still relieve the Orange Line, we’ll see. It would very difficult to directly connect the Deux Montages line and Blue Line – they use different technology (rubber tire vs rail tracks, third rail vs overhead, different signalling systems and platform heights); and the blue line passes 50m above the Mont Royal tunnel. As for double-counting population — I intended this as a way to compare population and density near individual stations. If I reduce double-counting, this comparison goes out the window. This is a simplification in any case, as people will get to the metro from farther away via buses, or also possibly walking. It’s really interesting your infographic! If you could extend it to the bus lines too, than you would have a more accurate image. For example, the last metro stations are also connected to bus hubs, thus they serve more people than the residents living within 800m. This is a fantastic infographic for anyone who wants to know how effective the various transit corridors are. The blue line would obviously have been a better investment than the Laval extension – if ridership is what mass transit is looking for. Thanks for doing all this work towards the common good. Really wonderful approach! The concept of walkshed is so warm and fuzzy, it’s great to see it described for everyone to see. I was lucky enough to have lived in Montreal as a boy and to have visited recently, and am a walkability planner among other things, so this is particularly fun for me. For comparison, to help resolve any double-counting considerations regarding the areas of overlap (e.g., where 800m walksheds includes other stations’ walksheds, so people have more choice), there could be another map, or an underlayer here, showing in blobby-form, the true 800m walkshed for all stations. As an alternative this could be placed on a good map of the city. Then we could also hatch the areas underserved by transit and consider where there could be improvements, or reduced development over time (e.g., restoring natural areas with transfer of development rights). A fine point: nice definition that walksheds are “the area around a particular point of interest from where people are willing to walk to said point of interest”, however this is of course an oversimplification, everyone’s preferences may differ, so the 800m used is more of an average. Interesting, but flawed. Understates stations such as mont-royal, berri-uqam, guy concordia. Should work in some bar/restaurant statistics to account for nightlife. Very Nice! Can the same infographic be generated for Montreal’s CyclingShed, let’s say within a 3km radius of stations? It would also be nice to shade the zone covered, just to see how much of the CMM territory the CyclingShed covers. I’m sure the infographic would show the viability of deploying the BIXI network and Vélo-Stations around those stations. Fascinating, as pointed out, to see how well some AMT stations are placed and how poorly some Metro stations are placed. The Red Line (Line 3) was to run from (I believe) Bridge St to Cartierville (yes, the Deux-Montagnes line had a spur to Cartierville). It was to use more standard steel-wheel technology. The only reason it never happened, or at least didn’t get to the point of serious negotiations with CN, was that Montreal was awarded the 1967 World’s Fair … and a Metro line was needed to serve that. What I’ve always been curious about was how the Expo Express fits into this scenario. Was there any connection between that project, which was pretty extensive and used standard technology nearly identical to TTC trains of the time, and what would have become Line 3? Seems to me that it’s almost as if the cars got displaced from one project to the other (and then scrapped, sadly, long before they were worn out). But I’ve never seen a hint that that was the case. As for adding buses, I’d like to see the walksheds for some of the busier lines on the Frequent Network Map you made. This way to analyse the usefulness of each station does not include people transiting via a métrobus or suburban busses. By example, density around Honoré-Beaugrand my be low but is does not counts that almost every commuter from Montréal-Est or Pointe-aux-Trembles enter the métro system via this station without living in it’s surroundings. Just before Honoré-Beaugrand, Radisson was built especially to play the role of a bus hub. There are busses lines from the east-end, Laval, Terrebonne, Lanaudière and even the south shore coming there via A-40, Notre-Dame/Sherbrooke, A-25 or the tunnel. That’s why these stations count many entries but don’t have a really high population around. Consider too the fact that the Place Versailles mall has no population. I’m sure that there are some anomalies on other stations i know less. On the other site, very close stations such as Cadillac and Langelier or Berri and St-Laurent my share the same population, biasing the results. It’d be much more accurate if you didn’t include all the people who don’t walk, but drive to the nearest train station… For example, Deux-Montagnes has people from Deux-Montagnes, St. Marthe, St. Eustache, Oka, Pointe-Calumet, etc, etc, which is what’s making the AMT not putting either double deckers or much more frequent trains during rush hour (and more parking closer than 5 blocks away) a problem; there’s just too many people, the trains (especially a certain 2-3 in the morning and another certain 2-3 in the evening) are absolute hell to be on, but unless you like the idea of waiting another 20-45 minutes to get home, depending on the time, you’re stuck taking the rolling can of sardines.